The man behind this exciting new album project,guitarist Steve Smyth (Nevermore, Dragonlord, Testament, Vicious Rumors) is no newcomer in the metal music or shred guitar world, first being tipped for the top in Shrapnel Records president Mike Varney’s “Hometown Heroes” column in the October 1993 issue of Guitar World magazine. 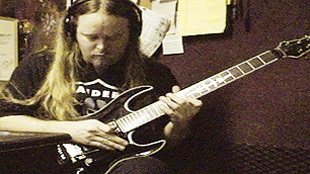 During this time Steve also helped form the lineup of Testament guitarist/founder Eric Peterson’s black metal side project, Dragonlord. Two successful albums followed over the next four years: Rapture (Spitfire Records, 2001) and Black Wings of Destiny (Escapi Music, 2005). 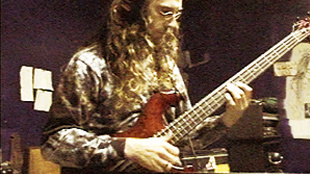 Smyth spent late 2003 touring the world with Nevermore, the well respected underground progressive metal band, in support of their album Enemies of Reality. In 2004, Smyth was invited to become part of the band’s permanent line-up, leading to the critically acclaimed album, This Godless Endeavor (Century Media, 2005), the band’s sixth full length, which featured several songs penned by Steve. A world tour followed, which saw the band play the first Gigantour, the brainchild of Megadeth mainman Dave Mustaine, and a headlining tour of Europe, as well as countless support tours. “This is certainly a different path I find myself going down, more in the area of progressive rock territory,” Smyth continued. The twelve songs (all produced and engineered by Smyth) are a collaboration between Smyth and his old friend and former bandmate, Steve Hoffman, a well respected classical and jazz musician, bass teacher and instructional author in Northern California. Smyth: “For this debut, Steve [Hoffman] and I went for more of a “soundscape” type atmosphere, rather than focus purely on the shred factor. We wanted to focus on the song, not merely use this as a vehicle for shredding over.” They also knew they wanted the best when it came to a percussionist. 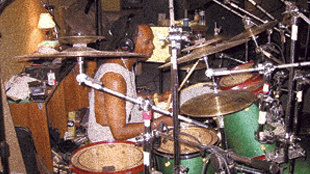 Enter drummer extraordinaire Atma Anur. Best known in the “shred guitar” circles as the man who drummed on countless legendary Shrapnel Records releases, Atma appears as special guest drummer on The EssenEss Project debut. Cacophony (Speed Metal Symphony), Jason Becker (Perpetual Burn), Greg Howe (debut), Ritchie Kotzen and Tony MacAlpine are just a few of the many influential and cutting edge guitarists and musicians Atma has worked with in the past. Recording largely on their own, Steve Smyth and Steve Hoffman, or “Ess en Ess”, take you on a 70+ minute journey through sonic landscapes that range from wildly progressive metal riffing, to experimental rock breaks, through to jazz fusion, with a whole host of other musical influences not normally associated with rock/metal, being stirred into the musical melting pot. “We’re both into a lot of different types of music, and wanted to get as much variety into each song, in as tasteful a manner as possible,” says Smyth. One listen to this incredibly ambitious debut, will tell you they’ve hit their mark.. While Steve Smyth assumed the role of engineer, and makes his producing debut with this album, this album has also benefited from the invaluable input of two illustrious individuals on the production side of the music world. The album was mixed by Kent Matcke (Metallica, Joe Satriani, Sammy Hagar) at his Pro Music Studios, and mastered by the one and only John Cuniberti (Joe Satriani, George Lynch, Michael Manring producer) at the world famous Plant Studios, all complemented by the excellent artwork from artist Asgeir Mickelson/MultiMono (done covers for Borknagar, Vintersorg, Conception etc). These selections were no accident. “We knew we wanted the best for this album, and I think we got some of the best, most experienced ears and eyes in the business in Kent, John and Asgeir!” says Smyth. Released on November 5th, 2007 through Steve Smyth’s own Two Louder Music label, The EssenEss Project will take you on a journey through many highly varied, mood driven, and action packed songs. Through their brand of instrumental progressive rock, they aim to bring melody, musical diversity, groove, and shred, back to instrumental music. World-wide download release: November 5th, 2007,via iTunes and all major digital retailers.